There are two ingredients that I require in a book selection, a great story and engaging complex characters. Bead Bai meets both of these expectations and delivers so much more. Sultan Somjee is the consummate storyteller and he writes with the same artistic vision as his main character, Sakina. She exhibits incredible depth and strength in her journey to become the artist she is destined to be. Somjee's Bead Bai took me to an exciting colourful world and he taught me things about a culture I knew nothing about and all with the breathtaking canvas of Africa setting the stage. The writing is rich and textured and weaves like a tapestry taking his characters on a journey towards their respective destinies. 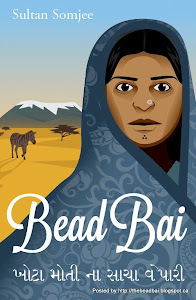 Although I enjoyed getting to know all of the characters in Bead Bai I especially connected with Sakina. I now feel that she is a friend of mine and I have been there to share in her fears, to lament her losses and to celebrate her triumphs. I have watched her grow from a young girl, to a wife, mother and ultimately into the artist every fiber of her being demands of her. To quote Somjee "one needs to eat this story" chew it slowly and savour every morsel.